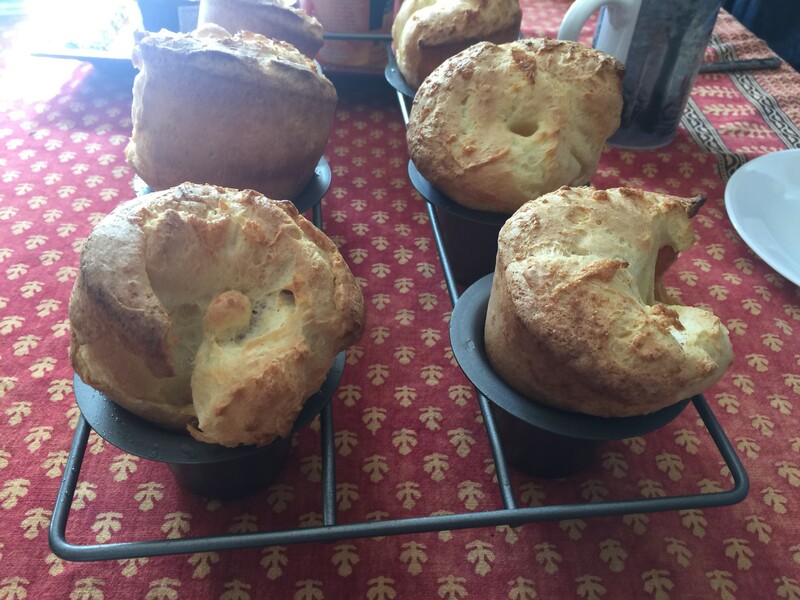 Look at the height on these popovers! They were so delicate and puffy! Serve with butter, jam, lemon curd, or eat them plain! I mixed up these two recipes (here and here) and the combination worked perfectly. Warm 1 cup milk to a little more than room temp (I used the microwave). Put 2 eggs in a bowl of warm/hot water to bring them to room temp (or leave them out overnight). Melt 3 tablespoons butter. Put milk, eggs, 1 tablespoon of the butter and salt in the blender and whip until frothy. Add flour and blend for a couple of minutes. Add a pinch of baking soda and blend for just a second to mix. Heat oven to 425 degrees. Let the batter sit while the oven heats. Pour remaining butter evening into popover pan and place in oven for a couple of minutes. Take out, pour batter evenly into pan and place in oven for 15 minutes. Reduce heat to 350 and bake for another 15 minutes.